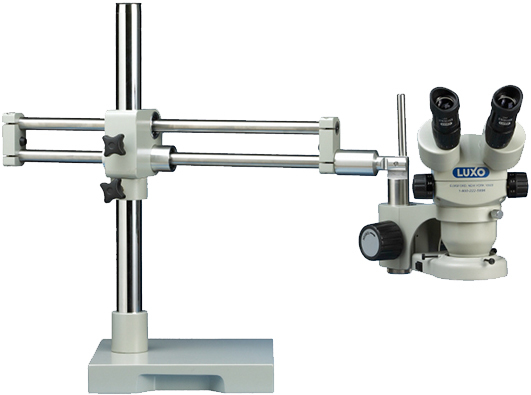 Binocular Stereo-Zoom 23mm Microscope with dual boom ball-bearing stand offers superior convenience and uncompromising optical quality. A 26" stainless steel horizontal boom extension and 19.5" vertical boom are mounted to a 10" die-cast base. Ball-Bearing design allows fluid horizontal extension of the boomstand. 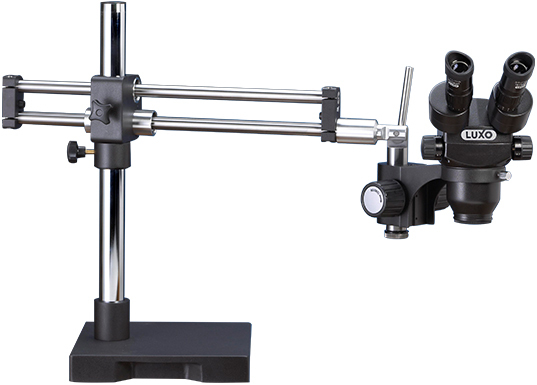 Extensive flexibility and adjustability allow this microscope to alter angles up to 45°; the head can be rotated 360° in its focus mount. 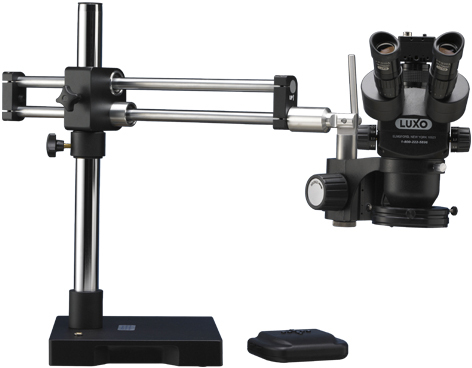 This 23mm microscope offers an 8” working distance (when used with a 0.5X reducing lens) and 15% greater field of view than comparable Luxo System 250 models. Microscope magnification range of 7X to 45X. System 273 ESD-Safe Binocular Microscopes are designed for inspection and assembly applications in static-sensitive environments. The body and stand are powder-coated with a metal-laced paint that measures 10^5 Ω/sq (static dissipative). 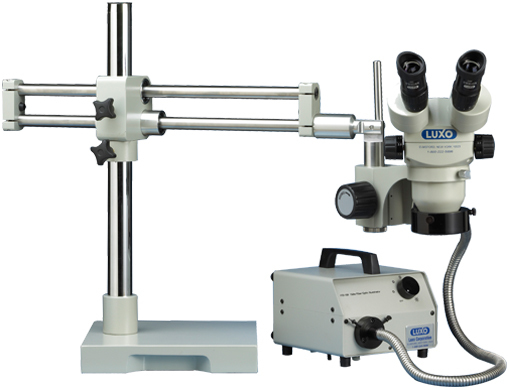 ​ Luxo microscopes feature high-quality achromatic lenses with anti-reflective coatings for superior visual clarity. 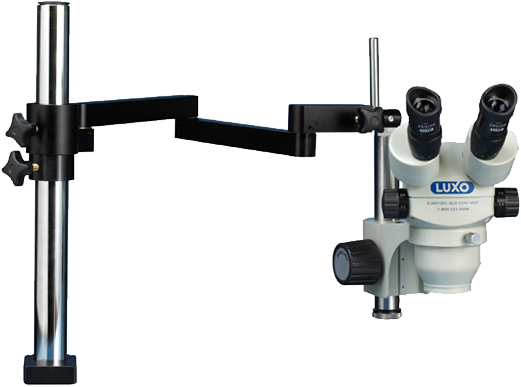 Optional eyepieces and accessory objective lenses can be added to provide a wider range of magnification. A choice of lightsources and mounting options enable the product set-up best suited for each individual application. Digital imaging systems are configurable to allow capturing of images to catalog or share inspection results and observations, for archiving or communicating electronically. The end result is increased productivity with an easy-to-use product line. Die-cast aluminum housing. Electrostatic powder paint.ESD-Safe models are designed for inspection and assembly applications in static-sensitive environments. The body and stand are powder-coated with a metal-laced paint that measures 10^5Ω/sq. (static dissipative). Dual boom ball-bearing stand with 10" x 10" die-cast base. 17.5" vertical extension and 26" horizontal arm extension. Focus mount angles to 45º to permit additional viewing and inspection perspectives. Non-Illuminated boomstand with 11.25" x 11.5" die-cast base. 11" vertical post. Focus mount angles to 45º to permit additional viewing and inspection perspectives. 23mm, 0.5X and 0.7X Reducing Lenses sold separately. 17W fluorescent ring light, LED-3000 ring light, Dimmable LED ring light and Dimmable LED-High Output ring light available with select models. Additional lighting options sold separately.